Discussion in 'Magazines' started by Aja Mok, Aug 10, 2009. I don't like either covers. For a September cover there both quite bad. The August cover with Sigrid had more appeal. Thanks Aja Mok. I really like the first cover and the supplement cover. Don't feel the two main cover: not really attractive, and i prefer the sup... she has beautiful eyes. I don't know.. I prefer the second and the supplement covers. I the 2nd cover & the supplement.... but they seem a bit dark. Love the first cover shot by Knight. The first cover is better. I love Maggie's pose. Not a fan of both covers. I like the supp better. Hmm, she doesn't look her best in these photos. Way too much text again which overshadows her quiet beauty. 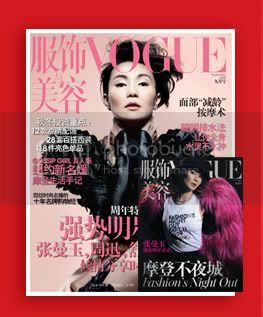 The cover she did for VOGUE China with Roversi was in another league from these.